Pisces boy - vulnerable, sensitive nature. Since birth, the baby is characterized by tearfulness, endless fears and doubts overwhelm him. Any rude word, careless gesture causes deep feelings in him. A quiet and calm boy tries to escape from evil and cruelty in an imaginary world. A fantasy-rich guy is constantly making up stories with a happy ending. Pisces — a sign that completes the zodiacal circle, empowers its representatives with the ability to foresee. The boy intuitively anticipates future events, perhaps, this explains his somewhat nervousness. Pisces lives in constant tension, he needs support. He is very attached to his family, he likes to spend time among close people. In a cozy home atmosphere feels completely safe. Belonging to a water sign explains the calm nature of a boy. He is deprived of leadership ambitions, avoids noisy gatherings. The guy is indifferent to material values, the state of inner harmony is more important to him. He is so focused on his own feelings that he is not at all interested in what is happening around him. Sensitive Pisces boy subtly captures the psychological mood of people: words do not matter, the main thing is sensations. The representative of the sign is woven of contradictions, he seeks support in the person of parents and friends. A person who has managed to understand the boy’s vulnerable soul will become for him an indisputable authority and close friend for life. A guy likes to be useful to someone, he is distinguished by a rare kindness of heart. He is always ready to sacrifice himself for the happiness of others. From it can turn out a great specialist in the field of psychology. The Pisces boy is a humanist and altruist, he thinks so highly that he is absolutely cut off from real life. He may be late for an important event, trying to save a homeless puppy. Parents will have to accept that their kind-hearted son brings home all the animals that he could only find on the streets of the city. He is unbearable to see the suffering of any creature, the boy will not participate in the brutal rallies of classmates. The guy will not mock the weak children, will try to take them under his protection. He is sensitive to parents, especially tries to please his mother, often gives her gifts: a bouquet of flowers, a cake of her own cooking, a homemade card. Generously endowed with intuition, the boy delicately feels the mood of family and friends. Pisces too close to the heart perceive any opinion, representatives of this sign are suggestible people. The words of support can so inspire the insecure boy that he will inevitably succeed. If the atmosphere of mutual hatred and incomprehension reigns in the house, the guy can close in himself. Close people should surround the sensitive boy with care and attention, he is too painful to perceive quarrels and scandals. Pisces — the weakest of water signs, its representatives always and in all doubt. The boy suffers from his inability to make a firm decision, all the more so — to defend him. He thinks too long, carefully weighs all the arguments. Such a feature of character causes irritation among strong-willed people. An ambitious father can feel frustrated, watching the behavior of his indecisive son. Parents should understand, this is an innate feature of the character, it is impossible to get rid of it. 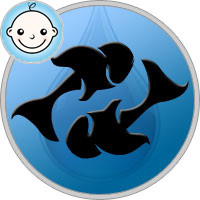 The Pisces boy has a rich imagination, loves to compose fairy tales, in which he is a fearless hero. Fantasies soften the brutal reality of the surrounding world. The guy likes to indulge in dreams, he can make a talented writer. Sometimes he is too fond of his fantasies, parents should teach their son to solve pressing problems. The imaginary world is an unreliable construction, capable of crashing at any moment. At an early age a child is very often sick, a fragile organism is prone to infections. Parents have a lot of time to give to the health of the baby, a favorable effect can be hardening. Impressive boy often naughty, it affects every little thing: bad weather, a small quarrel between parents. The kid does not have a good appetite, does not seek to communicate with peers. Parents should be sympathetic to the desires of the son, his intuition prompts the right decisions. In school years, the Pisces boy is still a mystery to the surrounding people. He is always calm, does not show activity either in studies or in public life. The schoolboy learns as well as necessary, so that his nerves do not get rattled. He can attend additional classes in drawing or singing, but will not develop his talents after graduation. Sports cause boredom in him, the guy does not strive for victory at any cost. The schoolboy is true to his ideals - silence and tranquility, a minimum of enthusiasm. In adolescence, a guy is inclined to commit rash acts. Trying to understand himself better and relax a little, a young man can acquire bad habits: alcohol, cigarettes, drugs. Parents should closely monitor the behavior of their son. It is necessary to establish a sincere contact, to inspire confidence in the guy. Reproaches and violence will not bring results, only will cause even greater spiritual discomfort, the sad result is depression. Parents can not be insured against an unpleasant surprise — the boy does not have goals in life. They will have to be interested in the boy himself, describing the advantages of this or that profession. Raising a Pisces boy is not an easy, responsible job. How successful the son’s life will be is largely dependent on the parents themselves. It is necessary every day to tell the child about his love. No reproaches and terrible shouting, the most effective way — care and attention. Adults should encourage the boy, teach him to overcome obstacles resolutely. The main role is assigned to the father, it is in his power to raise from a timid boy a real man.